The tradition is that ships have to be named something, and sometimes that means naming ships after famous people. Secretary of the Navy Ray Mabus announced May 18 the selection of the USNS Cesar Chavez as the 14th Lewis and Clark-class of dry cargo/ammunition ships. Continuing the Lewis and Clark-class tradition of honoring legendary pioneers and explorers, the Navy's newest underway replenishment ship honors the memory of Mexican-American civil rights activist Cesar Chavez. Chavez served in the Navy from 1944-1946 after which he became a leader in the American Labor Movement and a civil rights activist who co-founded the National Farm Workers Association, which later became the United Farm Workers. "Cesar Chavez inspired young Americans to do what is right and what is necessary to protect our freedoms and our country," said Mabus. "The Cesar Chavez will sail hundreds of thousands of miles and will bring support and assistance to thousands upon thousands of people. His example will live on in this great ship." Designated T-AKE 14, Cesar Chavez is being built by General Dynamics NASSCO shipyard in San Diego. Eleven of the T-AKEs are slated to serve as combat logistics force (CLF) ships, and three are slated to be part of the maritime prepositioning force (MPF). Cesar Chavez will serve the CLF missions, helping the Navy maintain a worldwide forward presence by delivering ammunition, food, fuel and other dry cargo to U.S. and allied ships at sea. "This proud ship will honor one American. But the story of my father's family is a lot like the story of so many other immigrants, especially Latinos," said Paul F. Chavez, son of the ship's namesake and president of Cesar Chavez Foundation. "They came to America seeking a better life. In so doing, they brought to their new land a fervent patriotism that has been demonstrated over and over again throughout the storied history of our nation. My dad was like many Latinos and African Americans from his generation who returned home in the years following World War II determined to see that the country for which they sacrificed lived up to its promise as a beacon to the nations of equality and freedom." 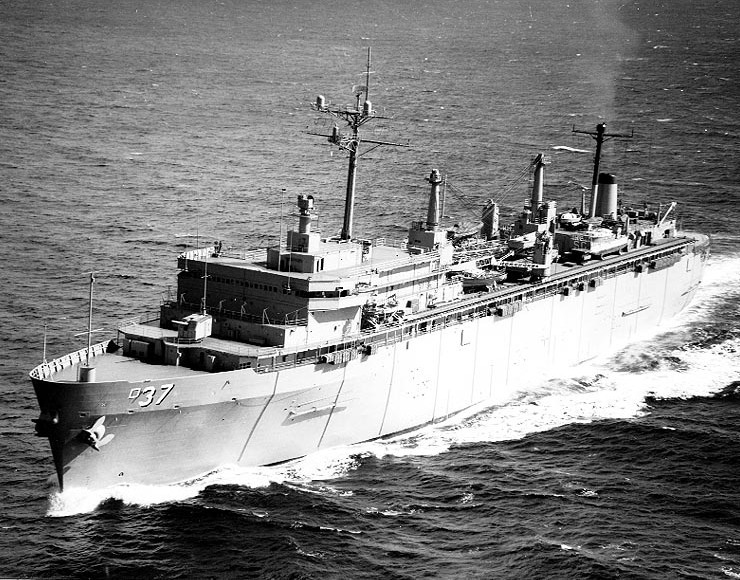 USS Samuel Gompers (AD-37) was a destroyer tender, the first of her class, and designed to be a floating repair shop for ships of the U.S. Navy either in port or at sea. The vessel was named for Samuel Gompers, a distinguished American labor leader during the late nineteenth century. During World War II, when production was maximized and the workforce was essential to victory, labor and management made great efforts to be as cooperative as possible. On January 12, 1942, President Franklin Delano Roosevelt reinstated former President Woodrow Wilson’s National War Labor Board to anticipate and resolve labor-management conflict. Labor Day ship launchings often feted the local labor community, but trade unionism was further elevated during the war by naming Liberty ships after labor leaders. Five Liberty ships named after labor leaders were launched on Labor Day – September 7 – 1942, and three of them were built in Kaiser shipyards. A sixth ship (the SS Samuel Gompers) was launched on June 28, 1944. Seven additional ships named for Jewish American labor leaders were launched between January 21, 1944, and October 13, 1944. Labor took the lead in this campaign. In July, 1942, the Sailors’ Union of the Pacific petitioned the United States Maritime Commission and the War Shipping Administration for a Liberty ship to be named in honor of Andrew Furuseth, the longtime president of their union. On September 7, 1942, the United States Maritime Commission arranged to have five ships launched that were named for labor leaders. The launch ceremonies, held at four different shipyards around the country, were to be linked by a coast-to-coast broadcast and feature speeches by John P. Frey, an executive of the American Federation of Labor, and John W. Green, president of the Congress of Industrial Organizations. The two organizations would merge in 1955, and the AFL-CIO remains the largest federation of unions in the United States. With thousands of workers looking on, three Liberty ships slid down the ways at the Bethlehem-Fairfield shipyards Monday as the climax to a Labor Day celebration attended by political notables and ranking labor leaders. For the rest, it was just another working day for Bethlehem-Fairfield workers as they followed the lead of other defense industries and stayed at their jobs. Two of the new vessels were christened in honor of outstanding labor leaders and one of them was constructed in the record-breaking time of 39 days. Labor men everywhere, Willis continued, “have turned their parades into the shipyards and other defense industries in order, that not one hour of their productive effort be lost.” John Green, national president of the Industrial Union of Marine and Shipbuilding Workers of America, spoke of the steady growth of unionism. “By persistent work and unrelenting efforts the workers have achieved recognition. Our organizations are accepted as a necessary part of free American society. Our job now is to demonstrate that we are worthy to inherit the Promised Land made possible by the struggles of our pioneers,” Green said. SS Andrew Furuseth. Built at Kaiser Richmond shipyard #1; sold to Norwegian interests as Essi, 1947. Scrapped in Japan, 1967. Norway-born Furuseth (1854-1938) was a merchant seaman and American labor leader. He helped build two influential maritime unions: the Sailors’ Union of the Pacific and the International Seamen’s Union. Furuseth served as the executive of both for decades. SS Peter J. McGuire. Built at Kaiser Richmond shipyard #2; scrapped 1968. McGuire (1852-1906) co-founded the United Brotherhood of Carpenters and Joiners of America in 1881 and was one of the early leading figures of the American Federation of Labor. He is credited with first proposing the idea of Labor Day as a national holiday in 1882. SS James Duncan. Built at Kaiser Oregon Shipbuilding (St. Johns, Ore.); scrapped 1962. Duncan was a Scottish-American union leader and president of the Granite Cutters’ International Association from 1885 until his death in 1928. He was an influential member of the American labor movement and helped found the American Federation of Labor. 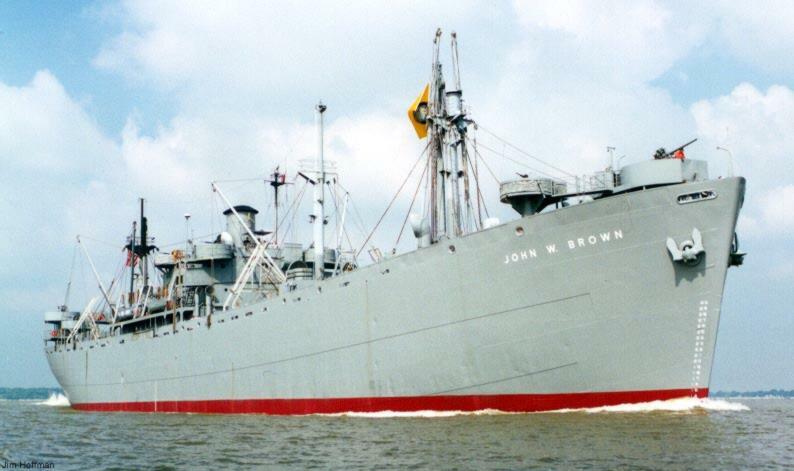 SS John W. Brown. Built at Bethlehem-Fairfield Shipyard, Baltimore, Maryland. John W. Brown (1867-1941) was a Canadian-born American labor union leader and executive of the Industrial Union of Marine and Shipbuilding Workers of America. This Liberty ship is one of two still operational (the other being the SS Jeremiah O’Brien, berthed in San Francisco) and one of three preserved as museum ships. The John W. Brown is berthed in Baltimore. 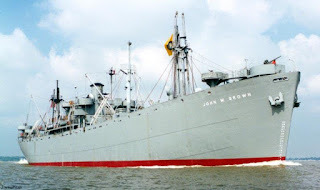 SS John Mitchell. Built at Bethlehem-Fairfield Shipyard; scrapped 1967. Mitchell was a United States labor leader and president of the United Mine Workers of America from 1898 to 1908. A sixth labor ship, launched June 28, 1944, was the SS Samuel Gompers, built at California Shipbuilding Corporation (Calship) in Sausalito. Gompers was the first and longest-serving president of the American Federation of Labor. She replaced a cargo steamship with the same name which had been torpedoed and sunk by a Japanese submarine in the South Pacific on January 30th, 1943. Seven other Liberty ships launched in 1944 were named for Jewish American labor leaders. January 21: The SS Benjamin Schlesinger was launched from the Bethlehem-Fairfield Shipyards. This was followed by the January 22 launching of the SS Morris Hilquit. Both were honored for their wartime contribution through the International Ladies Garment Workers Union. The SS Morris Sigman, launched from Baltimore on February 4, honored the former president of the ILGWU, followed by the SS Meyer London, another ILGWU leader. The SS B. Charney Vladek was launched from the New England Shipbuilding Company in South Portland, Maine, on July 7. She was named for Baruch Charney (1886-1938; he added “Vladek” as a nom de guerre surname in Tsarist Russia). Vladek emigrated to America in 1908, and was a Jewish labor leader and manager of the Jewish Daily Forward. UPDATE: As Colin notes in the comments below, President Reagan was a union leader, so USS Ronald Reagan (CVN 76) needs to be added to the list. USS Ronald Reagan (CVN-76), named after the six-term Screen Actors Guild (n/K/a SAG-AFTRA) President. I would not mind these so much if the Navy wanted to have a ship class named for labor leaders, and we all know that the Kaiser class was supposed to be just that. Not to forget tenders. What continues to bother me and others is that MSC ship classes almost NEVER reflect anything to do with the US Merchant Marine or Mariners. For instance, using Indian Tribes for the T-ATS(X) like was done for the T-ATFs, and using Merchant Marine world war heroes for the JHSV which was suggested.